Onam, the most popular festival in Kerala, is the day when the legendary Asura king Mahabali visits his subjects. As per story of onam, Mahabali had turned his kingdom into a virtual paradise on earth and the ‘devas’ could not tolerate this and they sought the help of Lord Vishnu to eliminate Mahabali or Maveli. Onam is perhaps a rare Hindu festival in which Lord Vishnu, the vanquisher, is the villain and the vanquished King Mahabali the hero. According Hindu Mythology, the Asura or demon King Mahabali made the utopian kingdom a reality. His fame spread all over the earth and the netherworld and slowly into the heaven. Indra, the king of Devas and the ruler of heaven, felt threatened by the growing popularity of Mahabali. 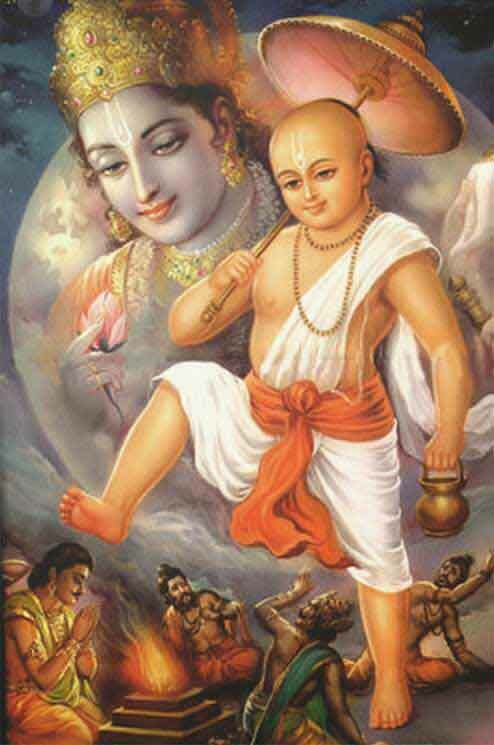 Aditi, the mother of Indra, observed a penance called 'payovrata' to help her son and pleased with her devotion Lord Vishnu was born as Vamana, a dwarf, to Aditi. Vamana approached Mahabali who was conducting a yajna. King Bali asked Vamana to choose anything that he wanted from his kingdom. Vamana asked for just three steps of land. And the king agreed readily. Suddenly, the dwarf sized Vamana grew into the skies and with one step covered the earth and with another step the heavens. With no place to keep the third step, Mahabali offered his head, which was pushed by Vamana into the netherworld or pathalam. But before sending Mahabali to the netherworld, Lord Vishnu gave Bali the boon that he can visit his subjects once in a year. The day Mahabali visits his subjects is celebrated as Onam. The story in detail can be found in the 8th canto of the Srimad Bhagavatam. Numerous attempts have been made in Hindu scriptures to bring shades of villainy into Mahabali’s character. Some wanted to portray him as a womanizer and others found reason in arrogance. But common man was never impressed by these explanations and they still believe Mahabali was unjustly overthrown. Perhaps the real truth lies in the Aryan – Dravidian conflict. Whatever be the reason, the Vamana avatar of Vishnu is remembered primarily due to the great King Mahabali. And in a rare instance an Asura or demon wins the heart of people over a God. Strangely, Kerala, the land associated with this unusual Hindu mythology, elected the first communist government in the world.